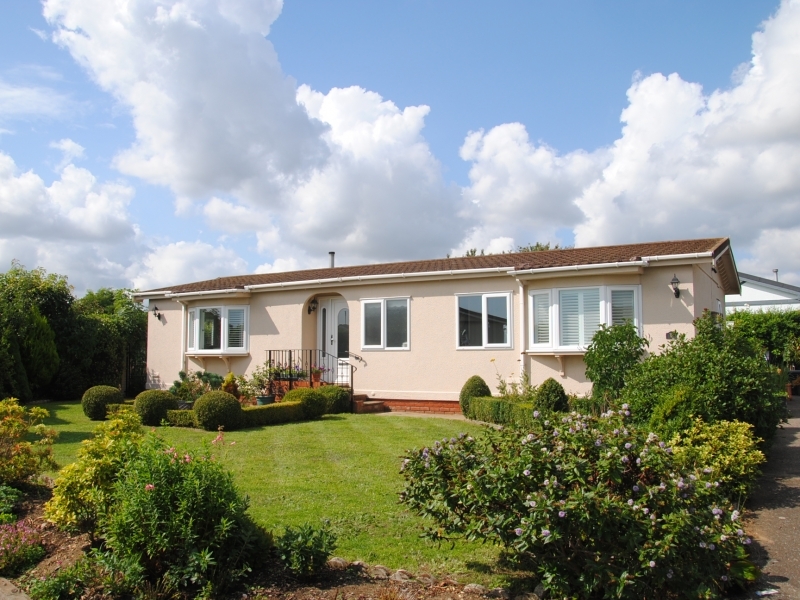 This Deben Lodge is an attractive modern park home bungalow in a central location on Priory Court. 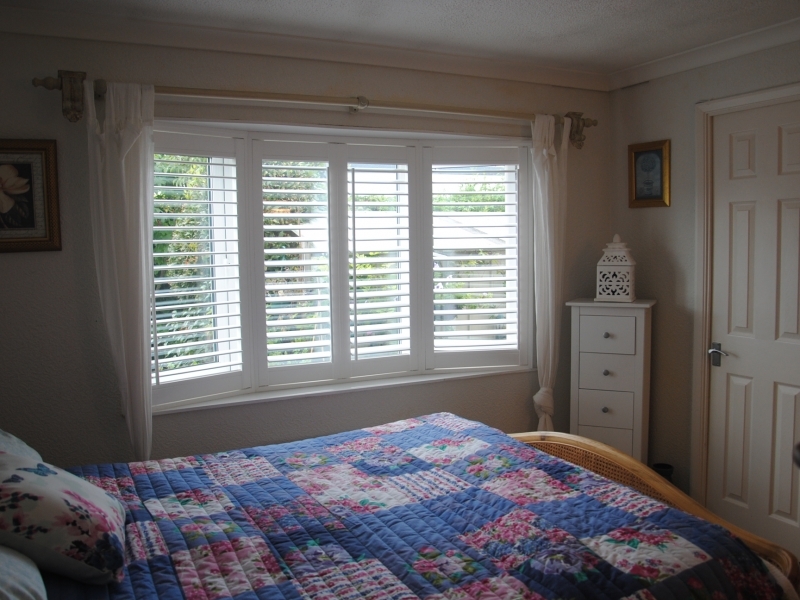 It has attractive white internal wood look shutters to many of the windows. The well stocked garden is charming with several seating areas, a glass house and sheds. All external doors and windows have been replaced in the last five years. The construction is timber frame with Decra tiled roof and double glazed uPVC windows. Central heating is by lpg combi boiler. The front door, in a recessed porch, leads to the Entrance Hall which has a cloaks cupboard and doors into the living room, kitchen, bedrooms and bathroom. White double shutter doors open into the Living Area (16’11” x 9,10″). 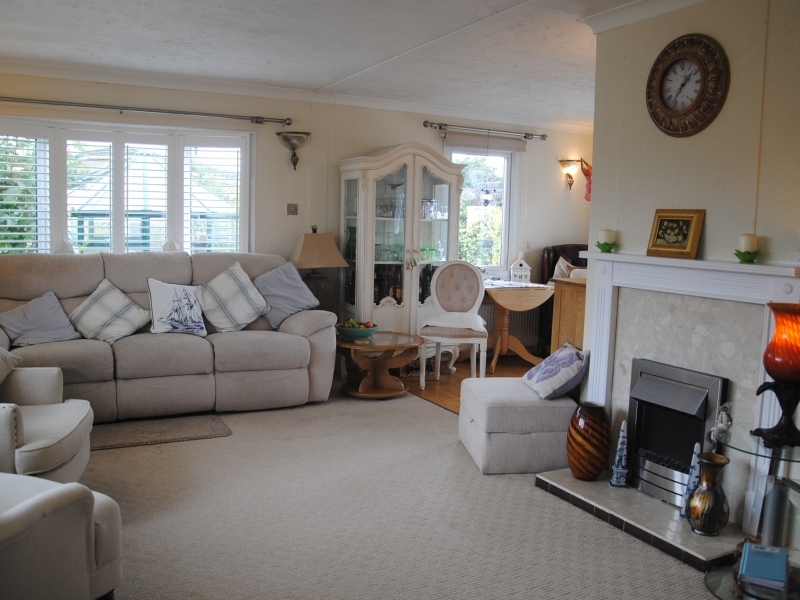 This is a light room with two sets of bay windows and a feature electric fire. It is open plan to the Dining Area (9’0″ X 9’10”) delineated by its laminate flooring. There is a further window to the south and patio doors open into the garden. A door leads into the Kitchen (18’3″ X 9’7). 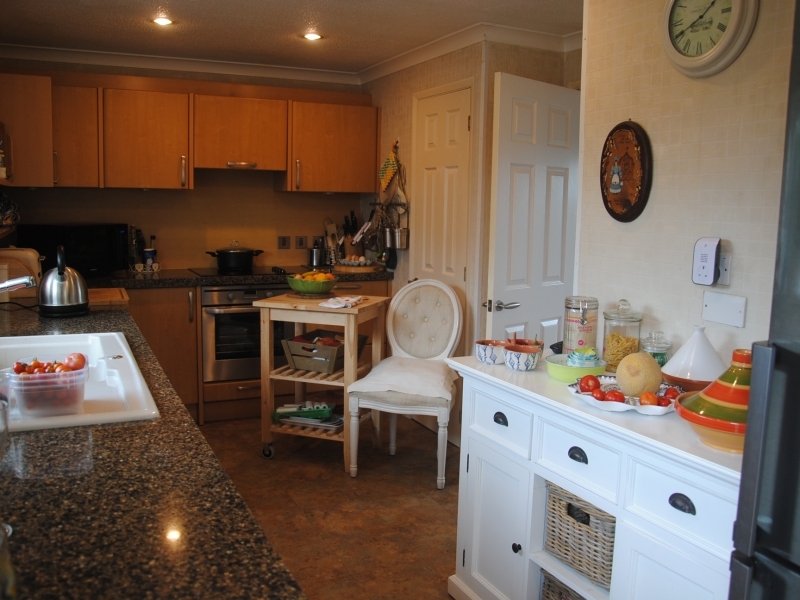 The custom designed kitchen is fitted out with numerous soft close cupboards and drawers finished in a light wood with terra ombra granite topped worktop. There is an oven and hob with extractor above and plenty of storage space along with an integrated washing machine and dishwasher. A water softener and filtered drinking water tap have been added. A glazed door opens into the garden. From the kitchen a door leads back into the entrance hall. It has a laminate floor which runs into the bedrooms. 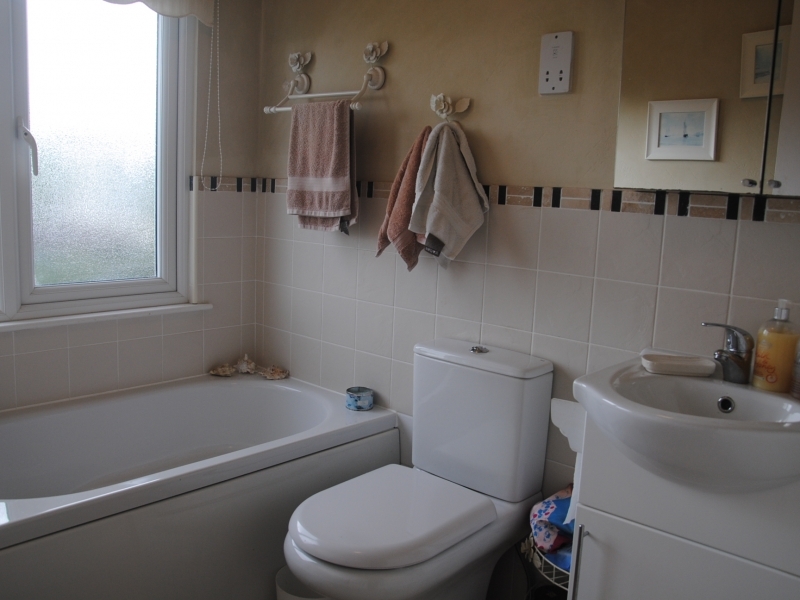 The Bathroom (5’6″ x 6’6″) has a white suite comprising close coupled WC, basin with vanity unit and small sitz bath. The Master Bedroom (10’9″ x 9’7″) has a bay window overlooking the garden. 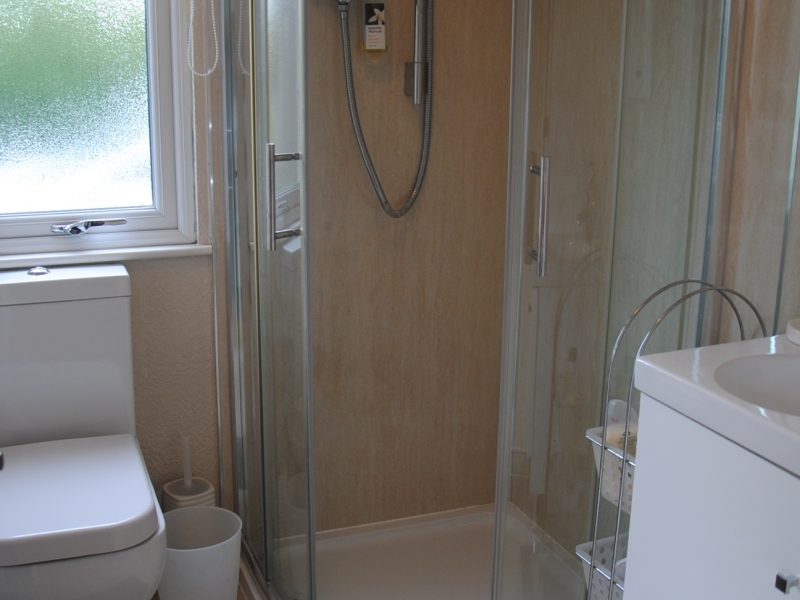 There is a walk-in wardrobe (6’0″ x 5’5″) with ample hanging space and an En-Suite (6’0″x 5’0″) with a corner cubicle, basin, close coupled WC and a tall mirrored cabinet. 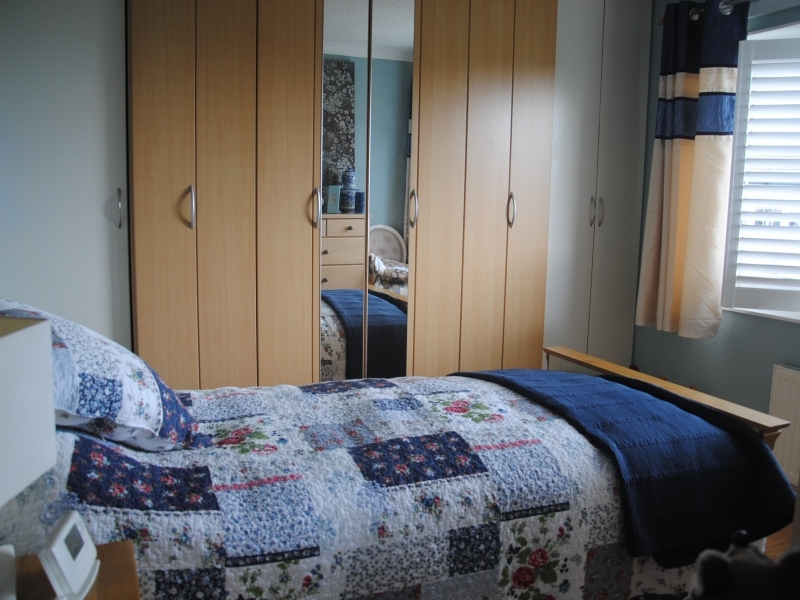 Bedroom Two (10’0″ x 9’7″) has a wall of modern wood look and mirrored fitted wardrobes. 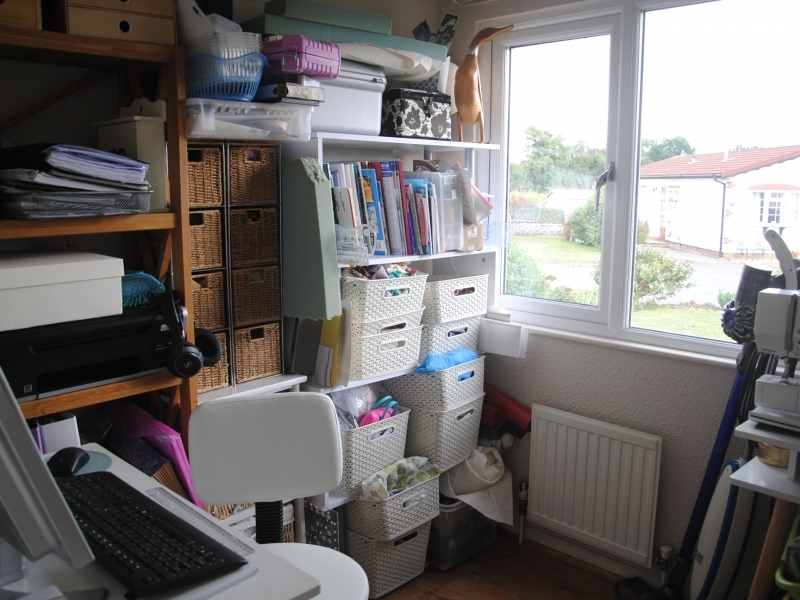 There is a further room which could be used as Bedroom Three or Study (6’12” x 6’6″) and is currently a craft room. The front garden is laid to lawn with stocked borders and paved areas (all pots are to be taken). A path leads around to the south and west where there are paved areas and a glass house/garden room. Privacy is provided by screen walling and established planting. It is a charming outside space with several seating areas. To the north is a large tarmac drive with two sheds and a working area. 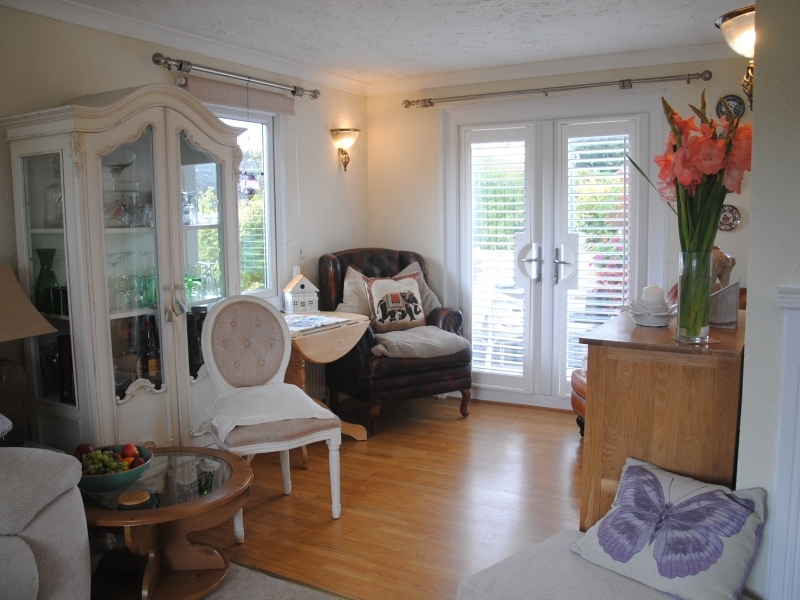 This home is sold with internal shutters and integrated appliances included. All furniture is to be removed.